Many apologies that this practice has not ceased. I have instructed the branch manager at Barking to get the drivers to sign a form stating that if this happens again it will result in a disciplinary process. Could you forward me the picture of the registration that you had and the date so that I can follow up the threatening behaviour that you mentioned. 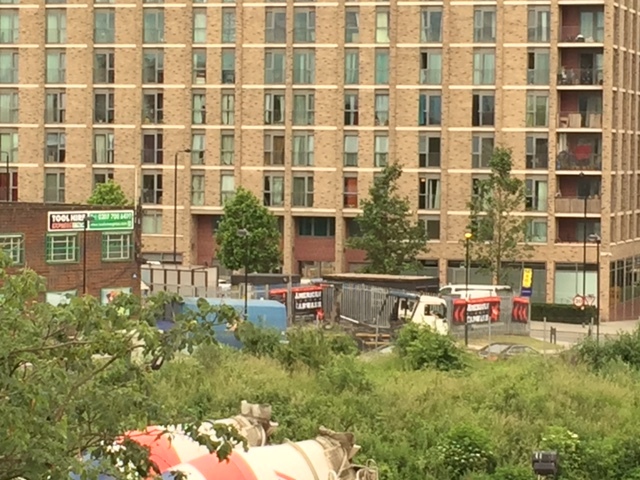 Yet on 16 June, the SUEZ/SITA drivers have this evening dumped another skip – the lorry with the white cab in the photo. In my opinion making this sort of noise at night that disturbs residents when carrying on a business is a statutory nuisance and therefore a crime upon which the council can act. It is also my opinion that this is a form of fly tipping as the skip is not a road vehicle and it is being abandoned. The best remedy for the council would be to prevent the skip being collected (a simple bicycle shackle lock on the lifting mechanism) and then scrap it. Or just not invite Suez to tender the next time a waste contract comes up. This entry was posted in New and tagged @suezuk, randellsroad. Bookmark the permalink.